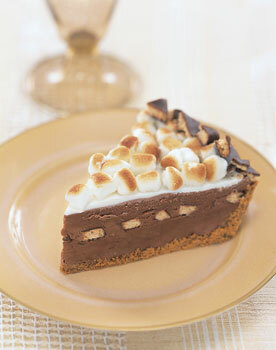 S’Mores are not just for kids sitting around a campfire. Chocolate, graham crackers and toasted marshmallows are an inspired combination and this dessert can be made year-round. No campfire needed, but you do need space in the freezer. (Make sure you clear enough room to place a pie plate perfectly flat in the freezer). The recipe uses purchased chocolate ice cream and in my opinion it pays to buy a high quality one. I love Haagen Daz for its very rich firm texture and deep flavor. If you’ve ever wanted an excuse to buy a small kitchen torch, this recipe offers a perfect opportunity as you will be browning the marshmallows. You can find these small torches at Sur La Table. Note that there are a few places where the pie has to chill in the freezer; read through so you plan accordingly. Take advantage of the components that can be prepared ahead: the pie and sauce can be made 3 days ahead. Re-warm sauce over low heat just until pourable before serving. For Crust: Position oven rack in middle of oven. Preheat oven to 350°F. Coat 9-inch-diameter metal pie pan with nonstick spray. Combine graham cracker crumbs and melted butter in bowl. Transfer to prepared pie pan. Press crumb mixture evenly over bottom and up sides of pan. Bake until crust turns golden, about 10 minutes. Cool completely. For Filling: Spread half of softened ice cream evenly over crust using an offset spatula. Sprinkle 1 cup chopped chocolate-covered graham crackers evenly over ice cream. Spread remaining ice cream over graham crackers, covering completely. Freeze until firm, at least 4 hours. Drop marshmallow creme by tablespoonfuls over top of pie. Use moistened fingertips to spread in an even layer, covering top of pie completely. Sprinkle mini marshmallows evenly over, pressing slightly to adhere. Cover and freeze until firm, about 4 hours or overnight. For Sauce: Bring heavy cream to boil in heavy small saucepan. Remove from heat. Add chocolate; let stand 2 minutes to soften, then whisk until melted and smooth. Use a small propane torch to toast the marshmallows to a light golden brown. Alternately, preheat broiler. Cover pie crust edges with foil collar. Broil pie just until marshmallows are golden brown, watching closely to avoid burning and rotating pan to brown evenly if necessary, about 2 minutes. Serve immediately, cut into wedges with warm sauce.